You are currently browsing articles tagged skysat. SkySat Mobile and One Mess (sounded like) with radio checks on a SkySat balloon. 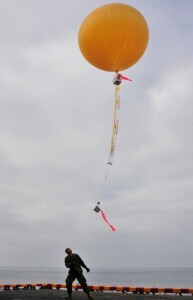 Jedi, Icepack, Blacklist, Crowbar and Skysat Launch conducting radio checks on a SkySat balloon. Icepack Maintenance and White Cell Maintenance w/ radio checks in the red and in cipher text. This was logged a few weeks ago when a SkySat balloon was up over Southern California. Active players on the net included: Icepack, Chaos, Zeus, Hermes 51, 53, 54 and Raider 28. They referred to the frequency as “Black” mentioned locations around Camp Pendleton. People as far away as Northern California and Phoenix AZ were able to copy these comms. Something a little different than the usual satcom stuff. For the second time in as many weeks, FM voice traffic from US military stations was monitored on 251.600 across a wide region in California and Arizona. Since this activity was monitored across such a large area, it suggested that the comms were originating from something at high altitude (either satellite or balloon). I personally thought the signal was much too strong to be coming from a satellite, and due to the fact it was not heard by remotes east of the Rockies, it had me leaning towards the balloon theory as well. Well, as luck would have it, today the users confirmed over the air that they were indeed using something called SkySat. A quick Google Search tells us that SkySat is “a bent pipe [radio] repeater the size of a coffeemaker” launched into near-space between 65,000 and 95,000 feet. It’s attached to what can be compared to a weather balloon, and its line of sight gives it a coverage “footprint” of about 600 miles that extends even into urban and mountainous environments with clear transmissions. Here is a sample of some of the radio traffic monitored today between stations Title Holder, Conductor and Black Watch.